Description A goblin lasher decided to visit my fortress, and was freely displayed as a vampire on the unit screen, and via his tile, which displayed the flashing nightcreature symbol. child of 0009182 resolved Toady One Vampire true names (and therefore their vampiric nature) revealed upon assigning occupations. Most likely fixed as part of 0009182. Reopening to post save as separate issue to 0009182. The visitor in the save was accepted into citizenship as part of a petition to stay as well, may or may not have something to do with it - I didn't look in the 'other' screen to see if he was outed first, as I assumed dance troupes wouldn't allow known vampires. Maybe he was just that good? I can confirm that the bug is still present in 0.42.03. 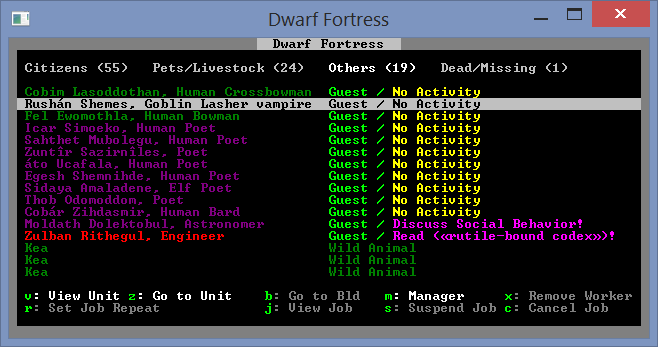 I currently am seeing a "Human Bard Vampire" visitor (not citizen) in the "Others" unit list. Double confirmed for 0.42.03. Shows up in the visitor announcement as well, which is super convenient. Kofi Lulushgastmar, Human Poet vampire is visiting.